Rudolf Virchow was an eminent pathologist and politician, widely regarded as one of the greatest and most influential physicians in history. A founding father of both pathology and social medicine, Virchow analyzed the effects of disease in various organs and tissues of the human body. He identified that diseases are caused by malfunctioning cells. A man of boundless energy, he simultaneously had four careers: medical scientist, editor of several medical journals, politician, and anthropologist. Although he played a tremendous part in ridding medicine of unscientific practices, he also made some rather large scientific errors. Rudolf Ludwig Carl Virchow was born on October 13, 1821 in the town of Schivelbein, in the German kingdom of Prussia. Today the town is called &Sacute;widwin and lies in Poland. His father was Carl Christian Siegfried Virchow, a farmer, and town treasurer of Schivelbein; his mother was Johanna Maria Hesse. The couple were not especially well-off financially and Rudolf was their only child. His parents loved the natural world and passed this love on to their son, taking him on bird watching trips. Rudolf attended elementary school in Schivelbein. From his earliest days at school, he seems to have been exceptionally gifted intellectually, so much so that his parents paid for extra lessons to push him forward. From elementary school he progressed to the Gymnasium (a high school for academically strong students) in Köslin, about 40 miles from his hometown. Rudolf’s high school curriculum was classical, with heavy emphasis on Greek and Latin. This was not a problem for Rudolf, who had a passion and remarkable ability for learning languages. In addition to Greek and Latin, he also learned Dutch, English, French and Hebrew. In his spare time between high school and medical school he taught himself Italian. He graduated from high school in 1839, aged 17. Abandoning his original idea of becoming a pastor – he didn’t think his voice was strong enough to be an effective preacher – he won a scholarship to study medicine at the Friedrich-Wilhelms University in Berlin, Prussia’s capital city. Completing his course in 1843, he spent short spells in a number of different medical jobs. His passion was pathology – the study of diseases. A man with incredible energy levels, Virchow enjoyed an important political career in addition to his scientific career. Here we’ll be concerned mainly with the science. Suffice to say that Virchow’s politics were liberal. He promoted better education, better living conditions, and better health for the poor. These political beliefs coincided with his ideas for social medicine. Virchow was elected to the German Parliament in 1880 to represent the party he helped found, the German Progress Party. He had a sharp tongue, and his political opponents became wary of his sarcasm. Virchow was ardently anti-Catholic, believing the Catholic Church’s influence led to bad outcomes for society and the poor. Virchow carried out the first systematic autopsies involving microscopic examination of tissue. One such autopsy in 1845 led to his first published contribution to science. Virchow identified and named the disease leukemia and offered the best description of it available. He named the disease by combining the Greek words leukos (white) and aima (blood). Even in his earliest work he focused heavily on cells. 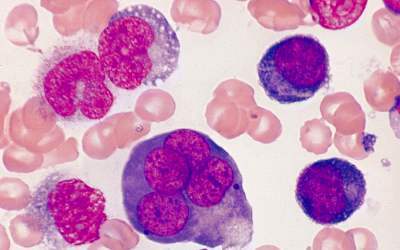 A microscope view of a bone marrow smear in a leukemia case. Virchow recommended systematic microscopic examinations of tissues from autopsies to diagnose causes of death. In 1847 Virchow started a new job, teaching pathological anatomy at the University of Berlin. Although he had once believed his voice too weak to preach, he became a supremely self-assured teacher and researcher. He was also ambitious, and had grown increasingly frustrated by the editors of German medical journals. They refused to publish some of his research papers: in Virchow’s opinion they were hamstrung by out-of-date ideas about medicine. In his new teaching job he met Benno Reinhardt, another young physician who shared his dim view of the medical journals. Virchow and Reinhardt decided to bypass the journals’ stuffy editors entirely. Virchow and Reinhardt’s journal has been remarkably resilient. Today it is still one of the leading medical journals, now called Virchows Archiv. Sadly its founding co-editor Benno Reinhardt died young in 1852. Virchow, who had a prodigious appetite for hard work, became the journal’s sole editor until his own death in 1902. Early in 1848 the Prussian Government sent Virchow to Upper Silesia to investigate a typhus epidemic that had begun the previous year and was claiming thousands of lives. After studying the situation, Virchow characterized the peasants of Upper Silesia as lazy and unhygienic. He was shocked at the extreme poverty they lived in and their extremely poor diets. He blamed their plight on the combined effects of the Catholic Church sapping their ambition and local landowners removing any wealth generated in Upper Silesia to be spent elsewhere. The medical consensus at the time, accepted by Virchow, was that diseases like typhus were caused by ‘miasma’ – bad air caused by rotting matter. Virchow believed malaria was caused by rotting vegetable miasma, while typhus was caused by rotting animal miasma. So, although he rejected some doctrines of medicine taught in ancient times by Galen, he did not question the truth of miasmas. Virchow did not recognize that epidemics are spread by microorganisms. He formed the view that the main cause of the epidemic in Upper Silesia was the terrible conditions most of the people were living in. He decided that if living conditions could be improved, there would be no more epidemics. Epidemics, he said, were best treated politically rather than medically. This is not entirely correct. However, he was correct to say that improving people’s living conditions, hygiene, and diets would be highly beneficial to their general health and well-being. And, although he did not know it, better hygiene slows the spread of the microorganisms that cause epidemics such as typhus, and more recently Ebola, bird flu, and SARS. “physicians are the natural advocates of the poor”. The magazine ran for about a year before folding, but in that time it was highly influential in promoting improved public health for everyone in Germany, including the poorest. In 1849 Virchow moved to University of Würzburg and began a program of serious research into the roles cells play in the body and in disease. 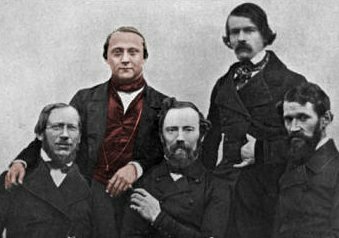 Rudolf Virchow, clean shaven, poses with other professors at the University of Würzburg in 1850. The great Theodor Schwann had pushed biological science forward dramatically in 1837, when he established that all animal tissues are made of cells. However, he made a major error when he said new cells are created from a fluid called blastema. Although incorrect, this was the accepted explanation for cell reproduction in the early 1850s. Although he was not the first person to suggest this, people only began to take serious notice after Virchow said it. It was a turning point in biology. 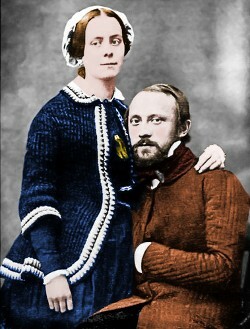 Rudolf Virchow and his wife Rosa in the late 1850s. They were married in 1850. In 1856 Virchow returned to Berlin to the Chair of Pathological Anatomy at the Friedrich-Wilhelms University. In 1858 he published Cellular Pathology, a groundbreaking book of 20 lectures he had given at the university, which laid the foundations of modern pathology and indeed of modern medical theory. Simply put, Virchow established that all diseases can be traced to cells. Diseases attack normal cells and cause them to malfunction. A whole organism does not get sick; each disease affects a particular set or sets of an organism’s cells, not all of its cells. Different diseases affect different types of cell. Virchow told doctors and pathologists seeking to diagnose diseases or to understand their effects that they could do this best by studying the affected cells. Trichinosis is a disease caused by Trichinella roundworm parasites. At its worst, the disease is fatal. 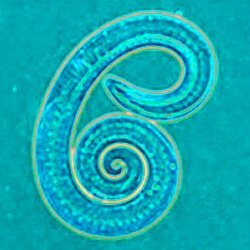 In 1859-60, Virchow discovered and described fully the life cycle of Trichinella spiralis in pigs and showed how the worms came to infect humans, causing the disease. He told people they had to cook pork well to avoid infection. Virchow showed how low-powered microscopes could be used to see the larvae of Trichinella in raw meat. He called for and, in Berlin, got meat inspections in abattoirs as a public health measure. Meat inspections carried out by vets then spread slowly through Prussia, Germany, and internationally. Bismarck’s challenge to Virchow was something of a media sensation. Sometimes readers will now find this duel is fictionalized as the sausage duel. In brief, the tale says that after Bismarck issued the challenge, Virchow accepted, and since he had been challenged, he had the choice of weapons. He chose pork sausages, a cooked one for himself and a raw one for Bismarck. The raw sausage would inevitably have infected Bismarck with Trichinella. Bismarck then withdrew from the duel. Virchow was tremendously far-sighted in his view of cancers. He wrote, correctly, that one important cause of cancer was inflammation caused by white blood cells. Unfortunately, he got the overall mechanism wrong, claiming the inflammation and so the cancer were spread by a liquid. In fact, cancer is spread by diseased cells, as established by Karl Thiersch in the 1860s. Sadly, and no doubt at the cost of millions of lives, Virchow’s correct claim that many cancers are initiated by inflammation was ignored for a long time. Virchow made a huge number of discoveries and contributions to medical science – too many to document in this simple article. He published over 2000 scientific papers and books, and powerfully influenced medical practice, medical theory, and public health practices in Germany and the world. He named and was the first to catalog conditions such as embolism, thrombosis, chordoma, and ochronosis. 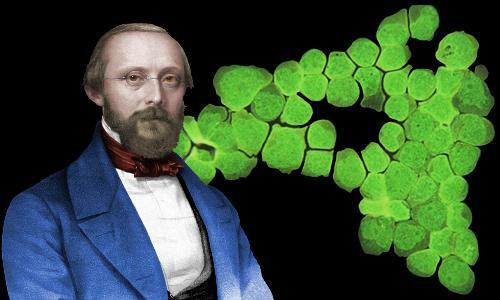 Virchow’s node is named in his honor, following his discovery that an enlarged left supraclavicular node is a very early sign of stomach or lung cancer. In addition to his work in medical science, he carried out an enormous amount of research looking at human ethnology and anthropology. Virchow believed the idea that humans were the descendants of apes was an attack on society’s moral foundations. In 1858, Darwin and Wallace’s theory of evolution by natural selection was unleashed on an unsuspecting world. In its early years the theory was highly controversial and was fiercely debated. Virchow opposed the theory from the beginning and never relented in his opposition. 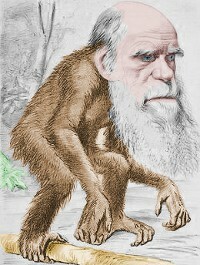 In fact, in 1877, he said the idea that man had descended from apes was an attack on society’s moral foundations. He voiced his opinion that teaching the theory of evolution should not be permitted in Germany’s public schools. Virchow also dismissed the first Neanderthal specimens, claiming they were modern Homo sapiens with deformations caused by rickets and arthritis. In the mid-1860s Virchow was the most important medical man in Germany, and his opposition significantly delayed the scientific acceptance of Neanderthal humans, particularly in Germany. The germ theory of disease had been around for many centuries, but was not taken seriously by most scientists until Louis Pasteur started advancing it, backed with experimental data, in the late 1850s. Virchow opposed the germ theory of disease. His own belief was that cells became diseased as a result of internal processes resulting from imbalances in the body. In fact, Virchow was partly correct: imbalances in the body can lead to cells malfunctioning and becoming diseased. However, cells can also become diseased when they are attacked by microorganisms. Virchow was wrong to oppose the germ theory. Ignaz Semmelweis was the doctor in charge of a birthing ward in Vienna, Austria. In 1847 he showed that if medical staff washed their hands before examining patients, death rates dropped dramatically. Many scientists, including Virchow, dismissed Semmelweis’s work as rubbish. Semmelweis died in tragic circumstances in 1865 following the ongoing unreasonable rejection of his work by other scientists. A very large number of unnecessary deaths were caused by the dismissal of Semmelweis’s work. Previous recipients included Benjamin Franklin, Alessandro Volta, Michael Faraday, Robert Bunsen, Charles Darwin, and Louis Pasteur. Virchow married Rose Mayer in 1850. They had six children: Karl, who became a chemist; Hans, who became an anatomist; Adele; Ernst; Marie; and Hanna Elisabeth. Apart from Karl, who died aged 61, the Virchow children enjoyed rather long lives – particularly for the era they were alive in – living to be 87, 99, 84, 85 and 90 years old respectively. Rudolph Virchow died at the age of 80 in Berlin on September 5, 1902 from heart failure. He had fractured his thigh falling from a tramcar in January of that year. Although at first he seemed to be recovering, he gradually fell deeper into ill-health. He was buried in the Old St.-Matthäus Churchyard in Schöneberg, Berlin. Rose was buried beside him following her death in 1913. "Rudolf Virchow." Famous Scientists. famousscientists.org. 15 Oct. 2015. Web.